It seems appropriate to write my first product review about a product I know extremely well, have used for years, and will continue to use for years to come. Plus I would be very surprised if anyone reading this knows about it so hopefully it will be interesting! I have so much faith in this product in fact that everything else I review from this point forward will no doubt pale in comparison. A pretty big claim I know, but trust me, I’m not exaggerating! Before I go on I should ‘disclose’ that I used to work for the creator of this product and she is still a very good friend of mine. I don’t consider myself biased however; if anything I have a unique advantage in explaining this product’s merits because I have met or at least spoken with nearly all of her longest-standing clients and heard their many remarkable stories of how this product has helped them. So what is it? Well, it is simply called ‘the Gel’, and it looks like just that – a clear, water-based gel. The ingredients are: deionized water, cesium salts, hypericum, arnica, calendula, rhus tox, ledum, apis, ruta, sulphur and carbomer. Some of these homeopathics may be familiar and you may be aware of their individual healing properties. It’s the cesium, however, that is the truly magic ingredient. Cesium salts (or cesium chloride) work in a similar way to acupuncture – by stimulating the activation of the enzyme acetylcholinesterase (don’t ask me to pronounce that!). The discovery that the activation of this important enzyme could be made without needles or moxibustion was made by a doctor practicing western medicine in China. It was his discoveries that laid the foundation for the creation of the Gel. In essence the Gel works by stimulating the immune system at a deep level to rejuvenate your cells from the inside, hence improving the condition and tone of your skin on the outside. Most people buy the Gel to achieve younger-looking skin due to these rejuvenating properties. Worn under moisturiser it provides a healing layer for your skin which helps even out skin tone, firm your skin and help heal any problem areas (aka spots!). But there are many more uses for the Gel. It is a healer and a pain reliever so can be used for pretty much any injury or skin condition – cuts, burns, sunburn, acne, you name it. I, for example used it when I had my wisdom teeth taken out. I put it in my mouth after the operation a few times a day, which is perfectly safe to do: it is safe enough to use on newborn babies and can be used anywhere on the body, inside or out. When I went back to my dentist he was really amazed at how quickly my mouth had healed. I’ve also used the Gel on burns. The most spectacular (and stupid) occasion was when I was in Thailand and decided (after too many buckets of that crazy Thai Red Bull stuff and various dodgy spirits) that the skipping rope lit up in flames which people were jumping over looked like a really fun game! Needless to say when I woke up the next morning and limped down the beach to the pharmacy to buy bandages for a huge oozing burn all down my leg I was very glad that I had plenty of gel with me to help relieve the pain and heal it. I have no scars now, which I largely thank the Gel for. 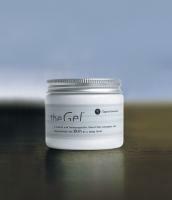 Beth Gagnon, the creator of the Gel, is a fountain of knowledge about the body and its healing powers. As well as creating this fantastic product over 20 years ago, she has years of experience running her own complementary therapy practice in central London (before that in California). Her work is centred on harnessing the body’s natural healing energy and she uses various tools which help to regenerate cells and eliminate toxins. There’s much more I could say about her work but I’ll leave that for another post! If you’re interested in the Gel you can email gagnon.beth@gmail.com or call 020 7224 2332 for more information or have a look at the Gagnon Therapies website (which is in line for an update very soon so I’m told). This entry was posted in Body, Essentials, Face, Healing Products and tagged anti-ageing, apis, arnica, burns, calendula, carbomer, cesium salts, healing products, hypericum, ledum, rhus tox, ruta, sulphur. Bookmark the permalink. Great post :-) and thanks for others comments too so that I can trust on the product. Beth used The Gel as part of a healing regime for me when I had a full hysterectomy around 1990! The doctor was amazed at how quickly my scar healed. She and her Gel are amazing and I am not just saying this because she is my sister-in-law. It is true! I’ve had the good fortune of personally experiencing the many amazing properties of The Gel for almost a quarter of a century. Also the good fortune to be with Beth (thank you) during the development of this phenominal substance. Use of The Gel for over 20+ years has led me to better understand the benefits that it has for me and a few friends. It speeds the healing of all wounds, it eases and removes the pain quickly, it staunches blood flow from a wound quickly, it helps to prevent scar tissue from forming, when put on severe burns soon enough, blisters don’t develop. It appears to work better on external wounds though it does seem to help internal injuries. In a world that supports numerous over the counter healing agents, this one is the real thing. This one is “Magic”. I had the pleasure of of meeting Beth Gagnon last month in London. I got my hands and my face onto The Gel. What amazing and instantaneous results. I could literally feel my energy shifting and my facial tissues tightening; puffiness beneath my eyes ~ GONE! Ok,ok,ok I HAVE to try the Gel now! Fab blog, look forward to reading more! Thank you!! I just came from Beth’s incidently and she’s armed me with more blogging material! I should update the post with her phone number as that’s the best way of getting in touch. It’s 020 7224 2332. Thanks! Join the Healing Network community!